SMS Service packages promotion, check coverage, online application. Cloud-based business telephony service which caters to big and small enterprises who wants a dedicated number and workforce mobility is essential. We ensure that our technology is up-to-date for you to remain competitive in Malaysia. Saves Up to 90% on voice charges! Need Telefonix VOIP for home or your business? TRUSTED : We are an authorized and registered agent for Telefonix VOIP . SAVE : No need to Telefonix Centre , crammed in traffic , looking for parking and so on . Experience more than 1 years in the registry and install Telefonix VOIP . Please check coverage , see the package Telefonix VOIP , register online or contact us for more information . 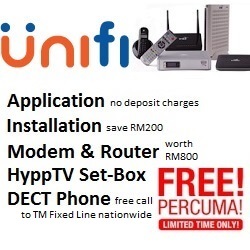 UniFi is not in your area? Let’s get broadband.